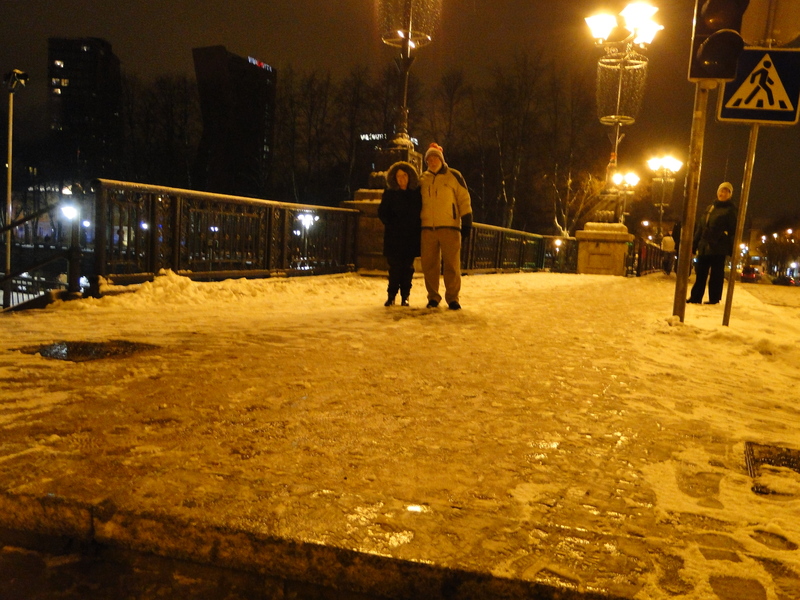 Some of you have commented that it looks really cold here but actually it has not been so bad. The cold and snow are much easier to deal with than the howling wind and rain of a few weeks ago. However, the last 3 days, the temperature has fallen considerably and it is a bit below zero in the early mornings– all the way up to 14 Fahrenheit right nowat 4:15 p.m. The word is that it may get as low as -25 F by this weekend. If that happens, I shall not be leaving my warm little apartment. Chuck will not have that option but at least it is a short walk to his classrooms. 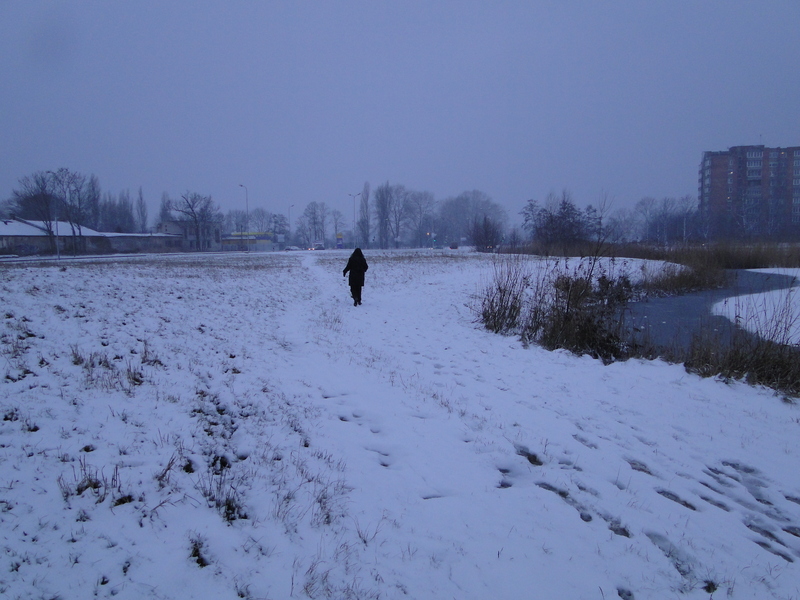 However, being much more disciplined than I, he insisted on heading off to church yesterday a.m. while I decided not to take a chance on getting stuck, as he did, waiting for a bus for 15 minutes in the cold. Given that there is a long walk at either end of the bus stop, he decided to walk all the way home figuring the total time out in the cold would be less that way. I feared he would get frost bite but that didn’t happen. 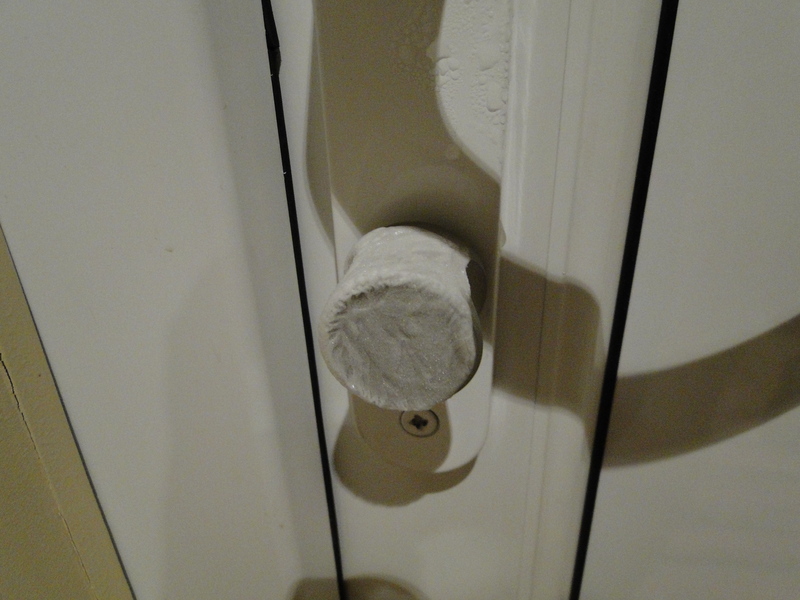 The frost on our inside door knob Sunday morning. As if he needed more to do, Chuck has taken on an additional job–he has agreed to help a local business man with his English. This gentleman, Algis, (and it is NOT so easy to pronounce as it looks–he laughed out loud at our first attempt to say it), already understands and speaks English but, as he often has to speak at meetings where English is spoken, he would like to improve his pronunciation, syntax, word choice, etc. for a better delivery. Of course, Chuck is happy to do this for whatever he can learn during the exchange. 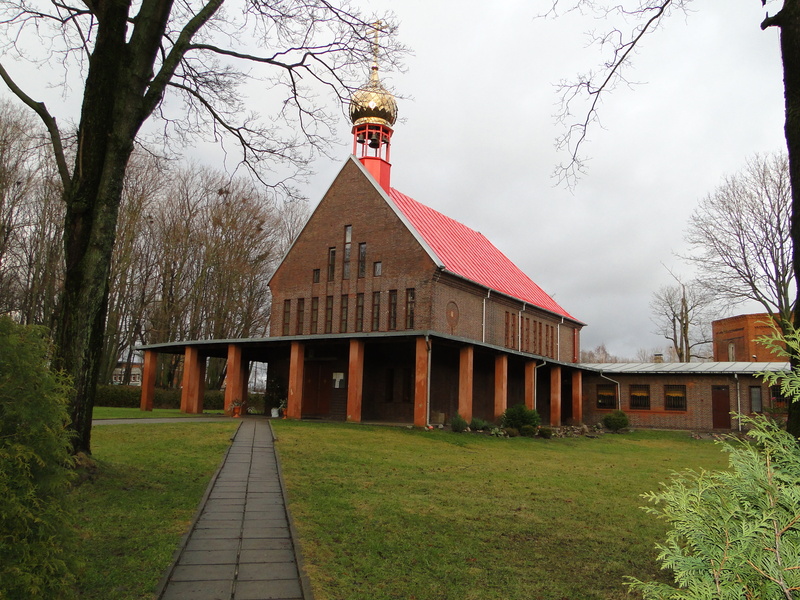 He began on Saturday by taking us on a little sight-seeing trip to the resort town of Palanga a few kilometers up the road. 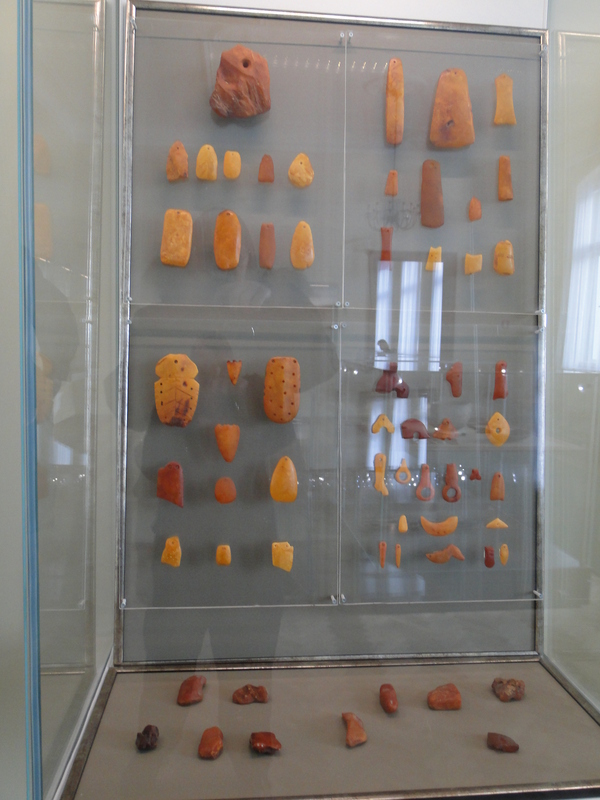 One of the main attractions is the Amber Museum which I have been looking forward to seeing since I like amber so much. 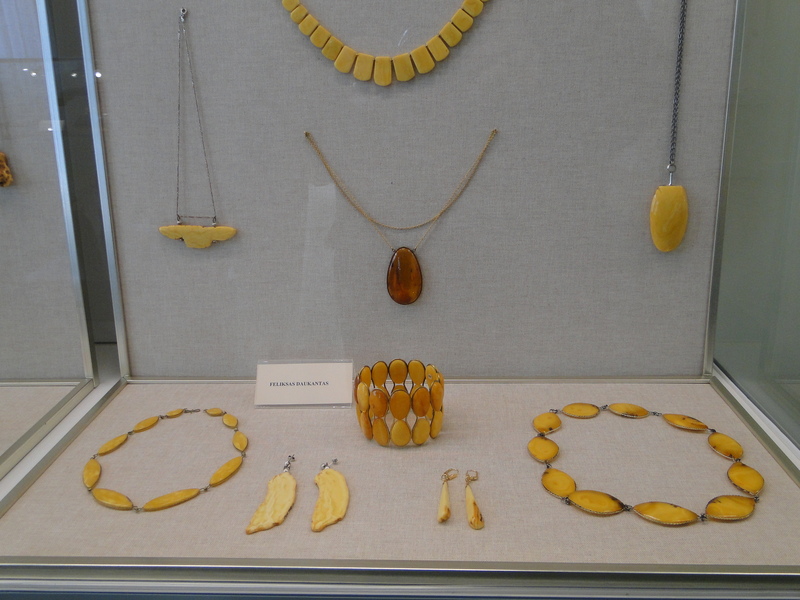 For those of you who may not be aware, this part of the world and, specifically, the nearby Curonian Spit, are famous for amber. 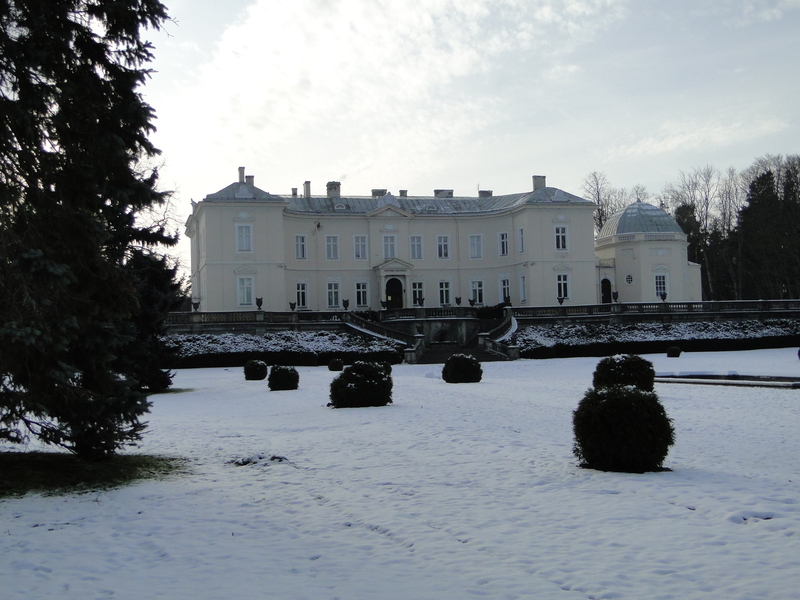 The museum is located in an old mansion in the middle of a lovely park. 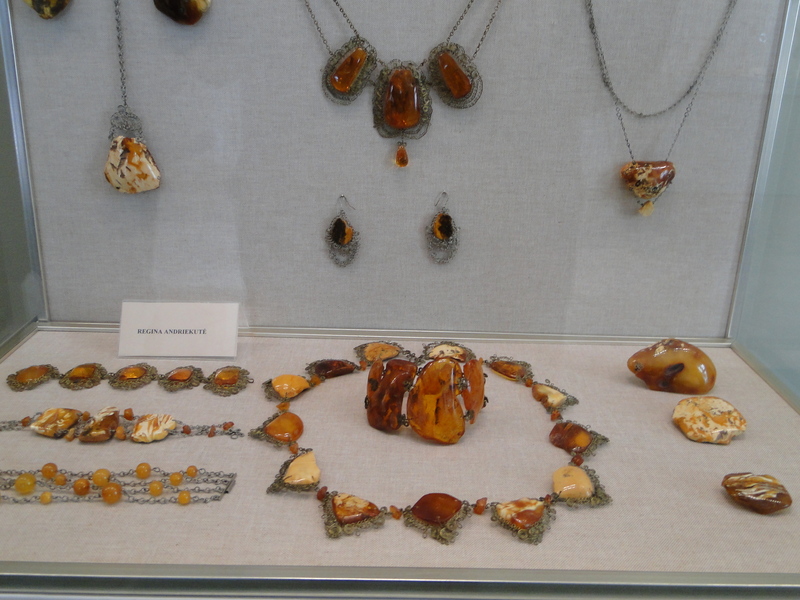 As you know, amber is often filled with insects and leafs etc. from thousands of years ago when it first formed. 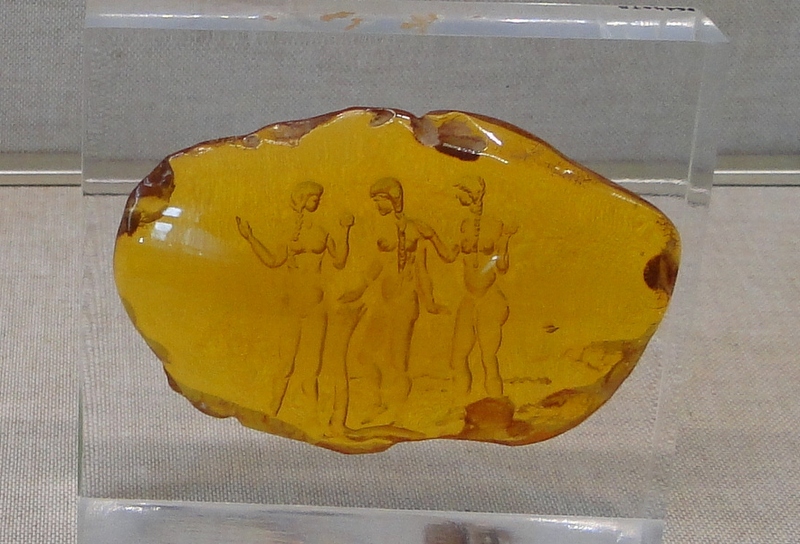 So we are wondering if this piece means that there used to be little fairies who somehow got stuck in the tree sap which made this amber? What do you think? 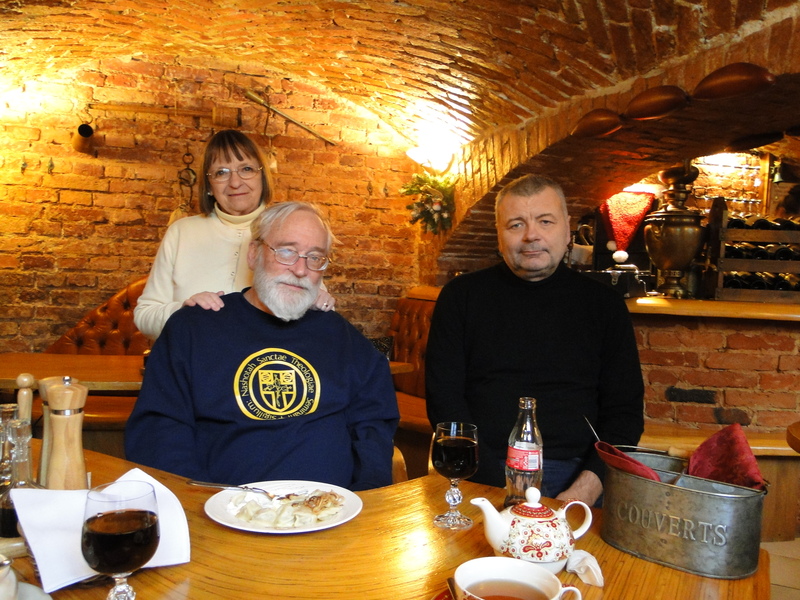 After visiting the museum, Algis took us to a really special little Ukrainian restaurant for a nice meal. It has occurred to us that we have eaten out 6 times now and have yet to eat traditional Lithuanian food. We’ve had German, Ukrainian, and Chinese. So we have to make a point to find a Lithuanian restaurant. Chuck's Chicken Kiev which he pronounced delicious. 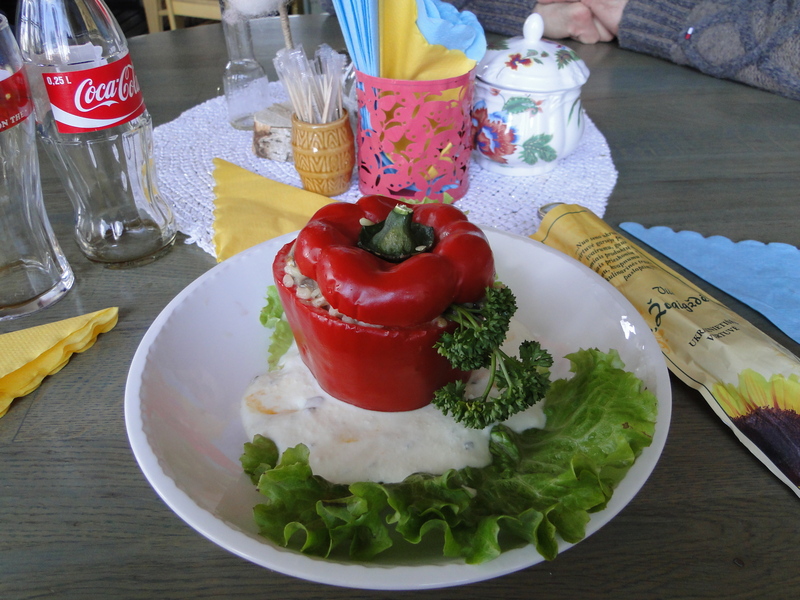 Bonnie's stuffed pepper, Ukrainian style--also very good. 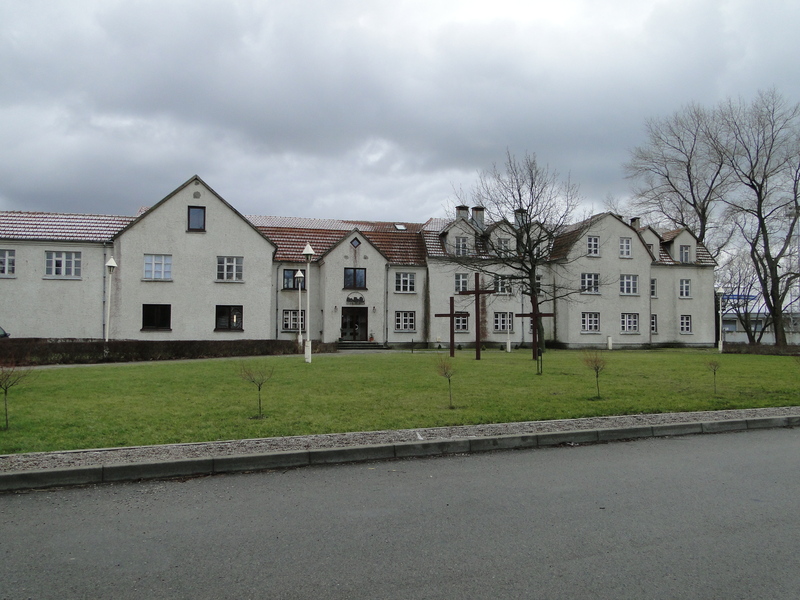 Swimming pool and gym built for the Soviet soldiers stationed in Palanga during the occupation. 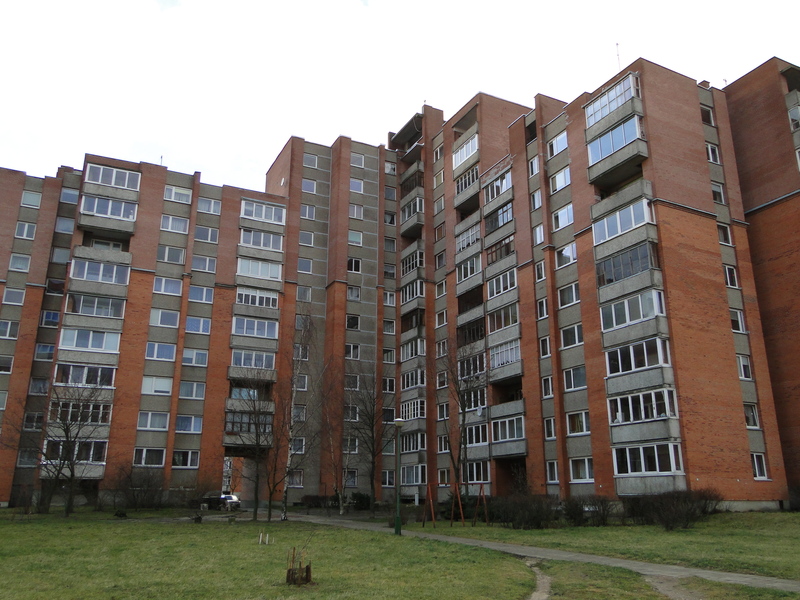 Notice the architecture--very typical--blocky concrete. Grocery shopping has suddenly become less of a chore–John and Rachel have purchased a car and we can catch a ride when they go. Life will be so much easier for them now–no more standing in the pouring rain at a bus stop with 2 small children. Of course we will no longer have the advantage of burning off calories while going to get more calories which is better for us in the long run. In closing, I apologize for an incorrect of spelling of a Lithuanian goodbye on a couple of our posts. During the years I used to teach at Siena, I’d always invite students I’d not had before to stop by for a chat, if they wished. Mostly they wished. The idea was to personalize what otherwise might be a dry and sterile relationship, get to know them better as individuals, and generally foster mutual understanding. Some times those conversations were very enlightening. “May I speak frankly?”, was always a bad sign. “You’re just like my father, and I hate my father” was one of my all time favorites. I grew greatly to sympathize with her father. At Siena I might have 70 – 75 students in a semester, perhaps half of them new to me. Here the load is 103, every last one of them a total stranger. 30 minutes per student, which is fairly short shrift, and you can do the math. It will take me probably four weeks to get them all in. Here the conversations are somewhat different than the Siena days. In many respects students are students everywhere (and I even have two Americans.) But in other ways, the differences can be stark. I have students from many countries, but with the exception of the aforementioned Americans, every one of them is from a country that used to be behind the Iron Curtain and, although that curtain is now torn, the lingering damage is considerable. In the old days, about the only way people could cope was to cheat, chisel, and cut corners. Each of the languages had some phrase meaning “on the left”, meaning that certain things had to be done with the left hand that the right hand did not acknowledge. Even with the (relative) freeing of societies, the old ways still prevail. Higher education is no exception. Almost without fail, students tell me that one of the great advantages of an education at LCC is that it is an honest institution, where one earns ones grades, not buys them. I find it almost incredible, but student after student tells me it is routine to pay a professor for a grade. Some even put out price lists – and it isn’t cheap. An “A” on a midterm might cost the equivalent of $50. A final somewhat more. And, in Moscow they say that getting past the exam required to move on to the next level of schooling could cost as much as $500! One impecunious student had to repeat a course three times before he actually got a fair grade. Apparently Lithuania is less bad than some other countries, but the practice takes place here as well. My favorite story is of a final exam where the professor left an envelope on his desk and announced the price to pass – or fail – the entire class, and left it up to them to distribute the burden. I would have loved to have been in that classroom to see how they sorted it out. Many principles of economics would have come into play. Clearly I’m missing the boat here. 103 students times $50 or so a pop, and this could give a whole new meaning to the word “volunteer.” Then maybe a discounted $30 for paper sumissions, $100 for a final – the mind boggles. I am certain that anyone trying that in the States would be promptly fired. I am equally certain that somewhere, some have done precisely this and gotten away with it. The graft rolls up hill, needless to say. The students are of the opinion, although not observing it directly, that deans and presidents get a slice of the action, or the professor will have to seek employment elsewhere. The other topic that comes up very frequently, given the mission of LCC, is faith. Most don’t have any. One conversation altogether too typical: “Are you a Christian? “Yes” “Do you go to church” “No – maybe Christmas and Easter.” “Do you think God would like your worship?” “I don’t know” “What makes you a Christian?” (After considerable deep hesitation) “Well, I believe in God.” “Anything else?” “You’re supposed to be nice to other people” “Do Muslims believe in God?” “Yes” “Do you think they are supposed to be nice to other people?” “I guess so.” “Are they Christian?” Total puzzlement. Then there are the measures I’ve been warned on to stop cheating on exams. That’s another day and another post. Meanwhile, I can never complain that I don’t have a full plate here. Probably most of you have noticed the change in pictures on the header of our blog. 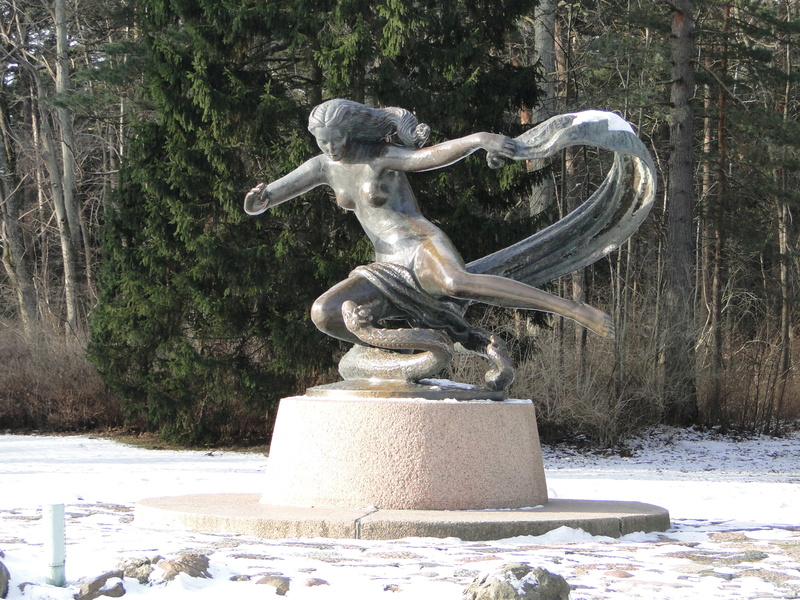 For several weeks we have featured a swan on a pond in Lithuania rather than the birds on driftwood in the Gulf of Mexico–which seems rather more appropriate. This swan is one of two who reside, sporadically, on the pond in front of our dorm and directly in front of John and Rachel’s apartment. I am delighted to have them there and have named them Lina and Jonas after the two Lithuanian children in the book we recommended to you recently. (Has anyone read it yet?) Perhaps they already have official names–they are banded so are officially recognized by someone. 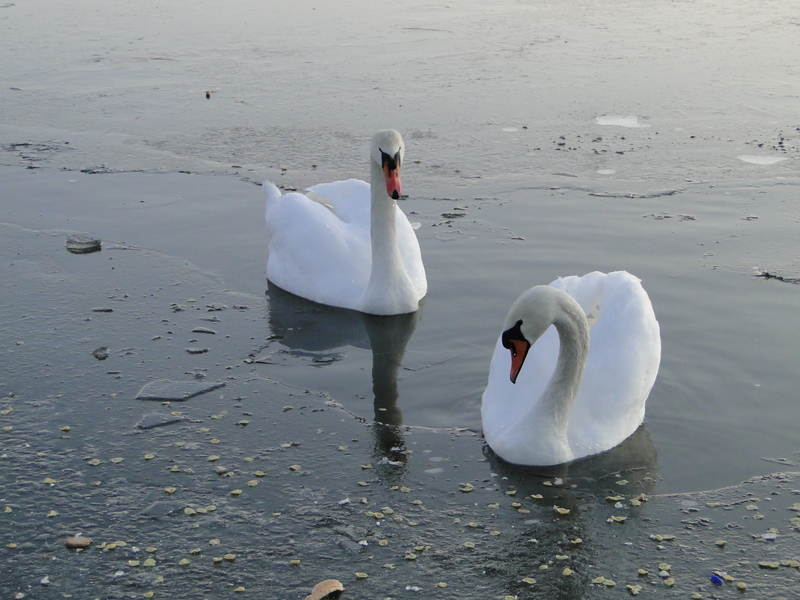 As it began to get colder here last week, the pond began to freeze and soon Lina and Jonas had only a small area of water to paddle around in. For two days they sat in that one little spot and I began to worry about them. Will they have enough to eat? Can they fly away if they don’t have enough water to get the “running” start they need to take off? They looked very sad. I took them some bread and tried with some success to throw it far enough that they could reach it. They seemed grateful–maybe. Finally, the 3rd day, I called someone at the university to see if someone Lithuanian might call someone else who would know what to do. That done, Jonas and Lina took off to wherever it is they go leaving me feeling pretty silly. I should have known that God would have anticipated that situation. While out feeding the swans, I encountered a young man walking his dog and we struck up a conversation of sorts. I say this because Dimitri is Russian and his English, while good, is slow and was a bit hard for me to understand. 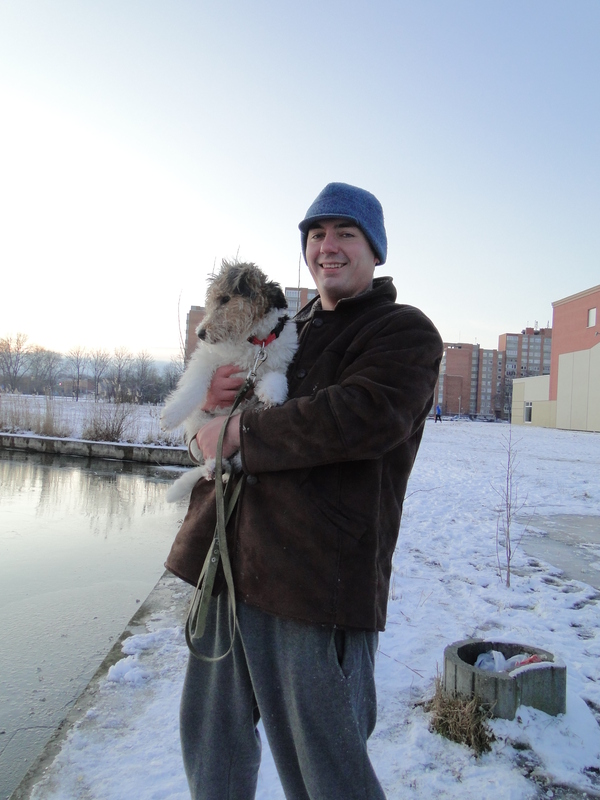 I did find that his dog is named Vladimir after Putin, and he has lived here in Lithuania all his life. He wanted to know if America is free and then, whether it is true that only 27% of Americans have passports. I did not know the answer to that but I understood that he was questioning whether, if Americans are really free, why do so few have passports. In Russia, I understand it is difficult to get a passport so he seemed to be doubting that we are really so free as we think. Who needs a dining room? Sorry, it's a bit blurry. Sunday, we joined the children and grandchildren at their church again This meant another long walk to the bus stop and a long,cold wait, this time in snow and wind. Rachel has just introduced the idea of a nursery for the young children at the church. She has been working the last couple of weeks on cleaning and painting the room and collecting and washing toys. It looked very nice. Believe it or not, the concept of a nursery is new here and no parents actually leave their children yet (just 2 Sundays into the endeavor) but they have a nice place to sit with them. The next step is to get parents to take turns watching the nursery while the other parents worship. This time, the translation equipment actually worked so we were able to understand the sermon. After church, they served a meal–sausages, noodles, and cabbage–which provided a nice time of fellowship. 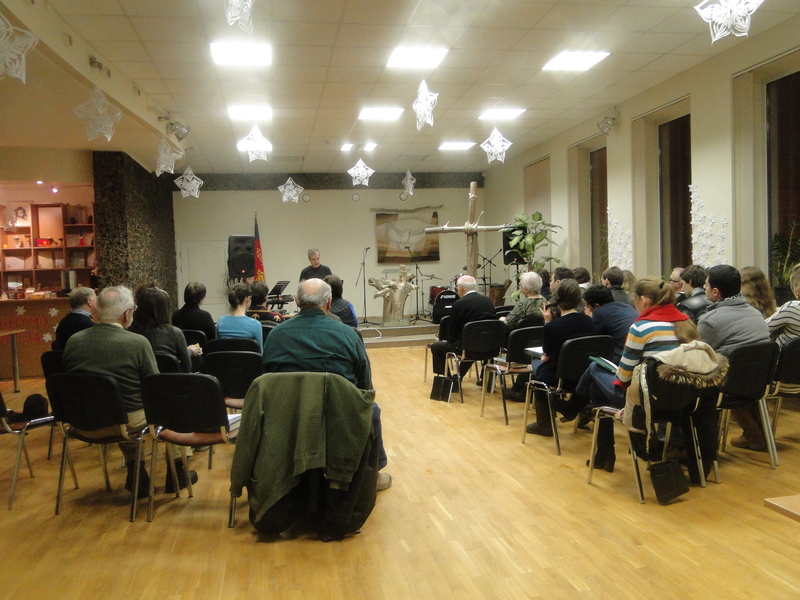 Sunday evening it began to snow again so we decided it was a perfect time to go downtown to the International Christian Fellowship which we had visited once before–the service is actually in English! We thought Old Town would look pretty in the snow and we were not disappointed. Tonight is the last in the long series of lectures from Calvin College and the speaker will be N.T. Wright, a former Bishop of Durham. The title of his talk will be “How God Became King: Why We’ve All Misunderstood the Gospels”. It should be very interesting and we’re looking forward to it. Here is yet another photo before I sign off–Noah and Chayah came to Grandma’s for lunch today and discovered these devices that fit over your shoes to give you traction when walking on ice. We have not used them yet but John and Rachel decided we should have them lest we slip and break something. 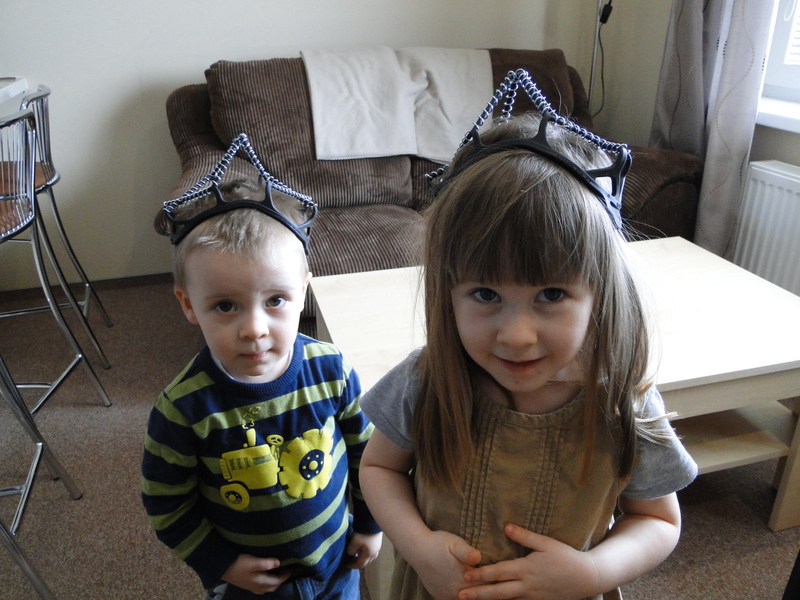 N & C decided they worked very well as crowns so I dubbed them the king and queen of Klaipeda. Church is a continuing problem, in order to find somewhere we feel properly worshipful. 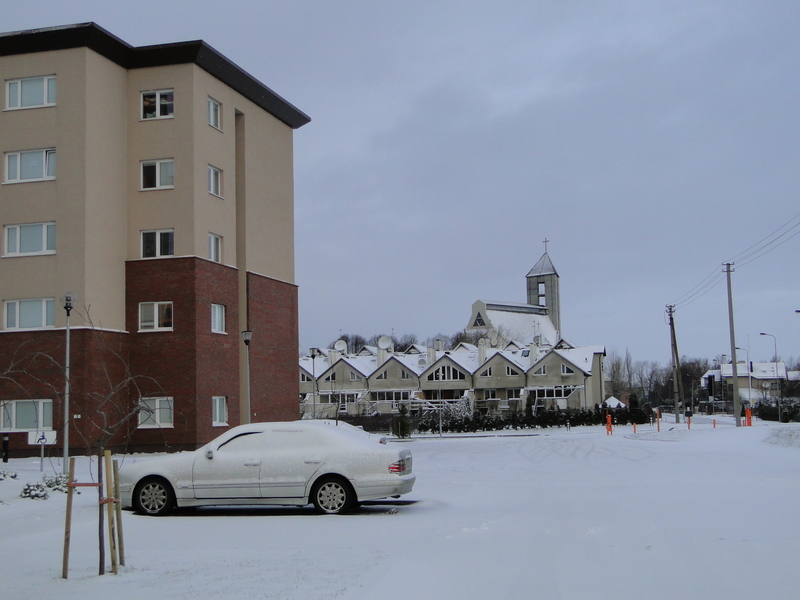 This morning we tried the Catholic church, a 3 block walk through the cold and snow. I was hoping I would recognize the liturgy even though in another language and would be able to sort of follow along in my mind. However, I didn’t know what was going on except for communion. This church is quite large and we estimated there might be as many as 300-400 in attendance which was good to see. Theater-type comfortable seats were also good to see. I hope to go back and take some photos. Today there were still 4 large Christmas trees in the sanctuary–don’t know when they consider Christmas to be over. The church was not heated except for 2 hanging, 5 -direction heaters. I promise to not complain about how cold The Redeemer is again. PORK ROULADE -2 pork ears, 4 pork feet, 3 chopped onions, 3 sliced carrots, bay leaf, parsley sprigs. Boil meat till soft, add vegetables and cook 30 min. Remove meat, flatten ears and let cool. Cut up meat from feet and layer on each ear. Roll up and tie with string, keep weighted down for 30 min. Remove string, place in deep dish and cover with cooking liquid,chill for several hours. Slice, place on serving platter and surround with jelled cooking liquid, sprinkle with carrot slices and decorate wit parsley springs. Serve with marinated beets. BON APPETITE! Some of the dishes actually do sound appetizing and we have had 3 good restaurant meals so I am thinking of asking someone at the university to get a local expert to come in and do a one-time cooking class on Lithuanian cuisine for those of us who are interested in how to make potato dumplings at least. 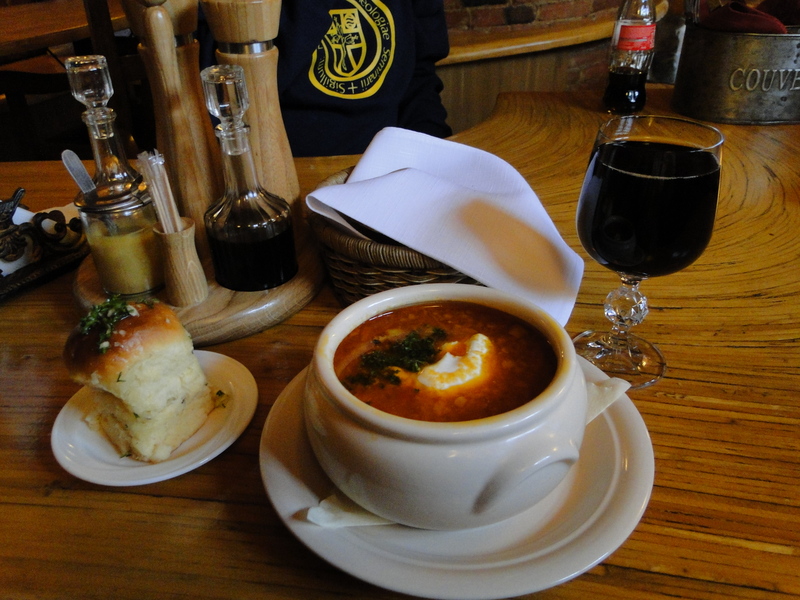 Speaking of food–we had a nice lunch yesterday when we were downtown with Egle. We first went to the bakery and coffee shop and learned to read the menu there (as well as eating bandeles–sweet rolls) and then went on to the market where she helped us in reading signs identifying different types and cuts of meat. I am definitely picking up more vocabulary all the time. Though I can read the words, I’m still having difficulty with pronunciation. I have decided not to take the Lithuanian class as it would require so much time and effort and it seems like a lot to give for something I will use for such a short time–I am happy just to be learning useful phrases and words for shopping and basic interaction with others. 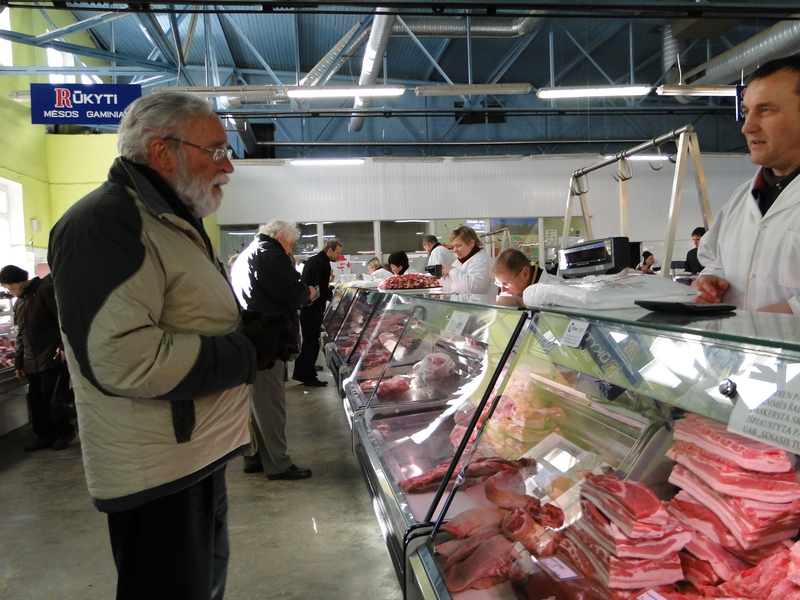 Here are some photos from the market and from lunch at the Stora Antis (Fat Duck). We pose with the owner in Stora Antis. An ex-sea dog from a tramp freighter. My delicious Borshch, accompanied by an elegant glass of Coke. 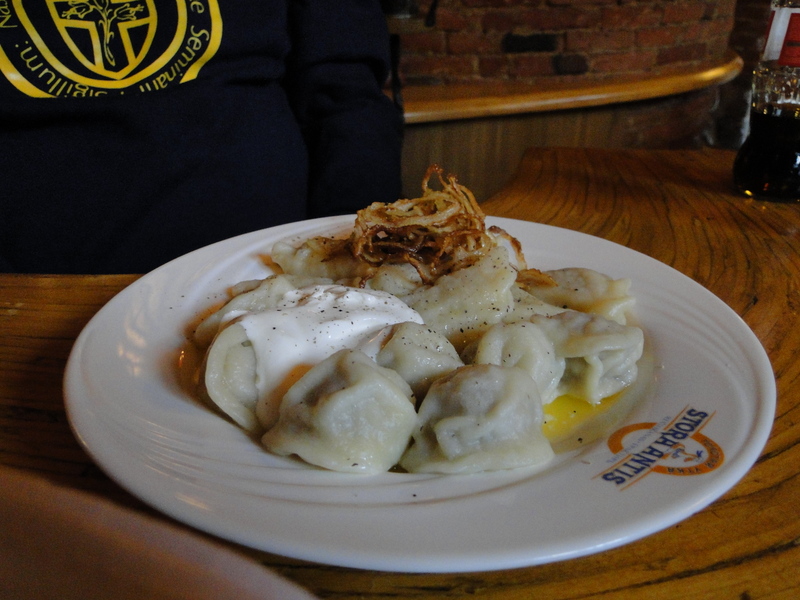 Chuck's dumplings, with sour cream and fried onions. 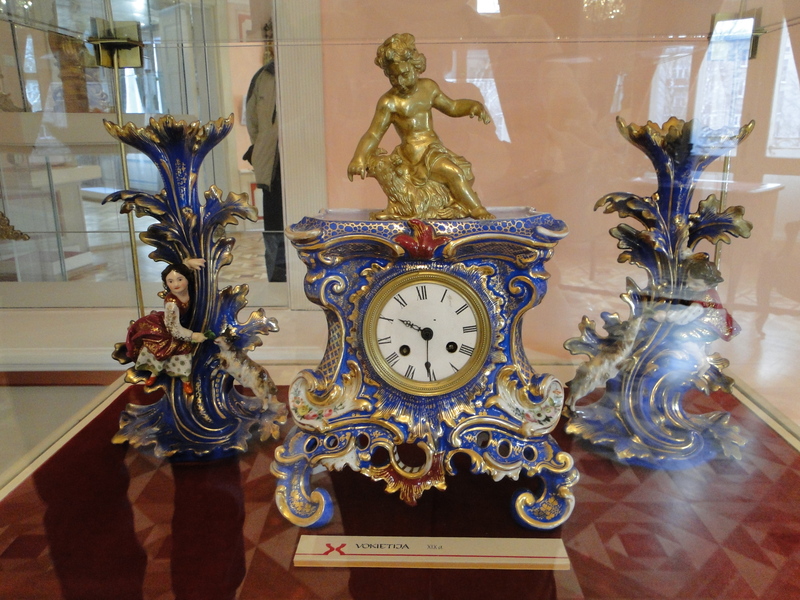 After lunch, Egle left us and we then visited the Clock Museum, a short walk away. It was not a bad museum–more than 1,000 clocks and watches including replicas of the very first efforts to measure time. 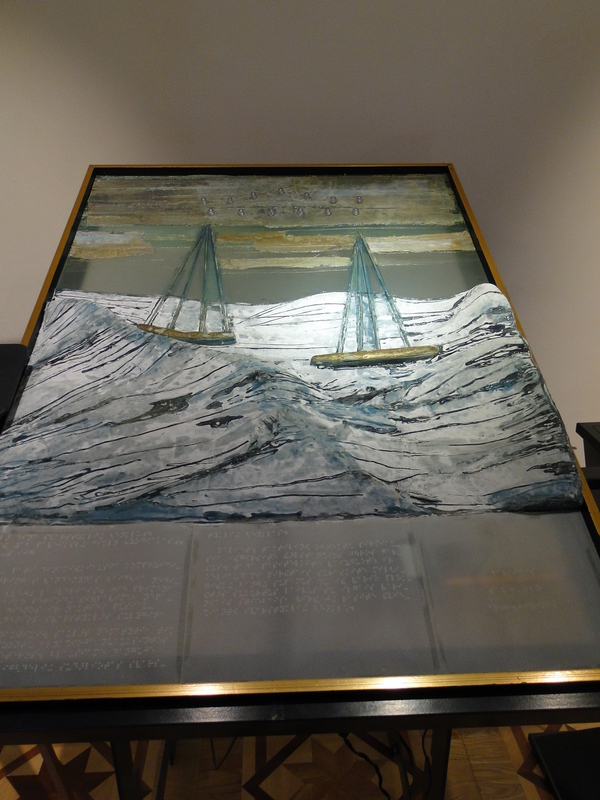 There was also a special exhibit of paintings which had beside them, as best as I can describe it, Braille copies of the paintings that could be felt by the blind–hills and valleys and various textures. I’m attaching an example and hope you can see it. The painting. Do not touch. Braille copy. 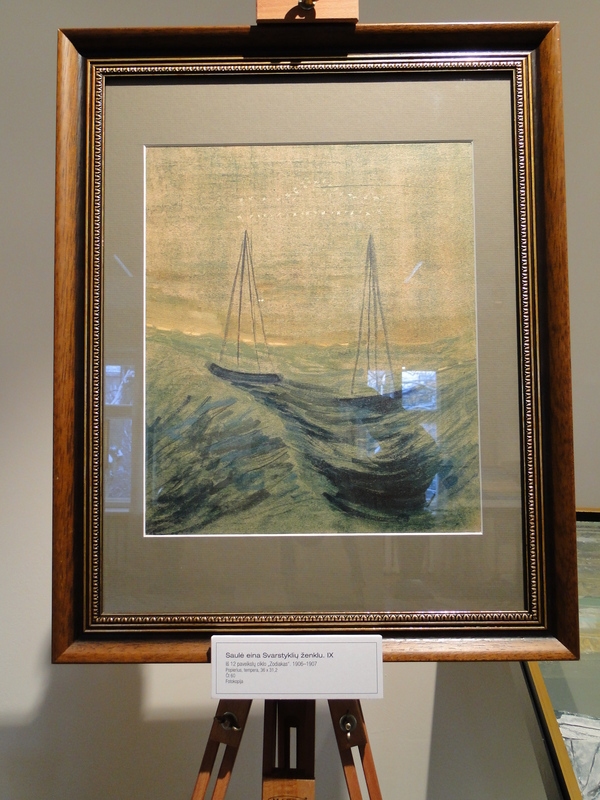 You were encouraged to touch the painting itself. Also had sound and light. 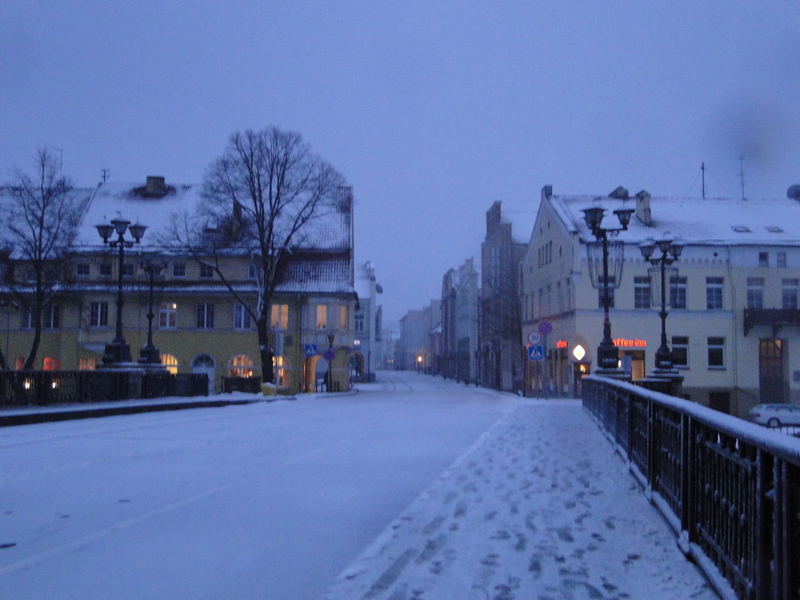 The end to a long day in downtown Klaipeda–we stop at the Ikki on our way home from the bus stop and pick up some supplies–as many as Chuck can carry–being gallant and aware of my aching knee, he insisted on carrying it all. Here he is, walking ahead of me looking like all the Lithuanians we see carrying their groceries home each day. 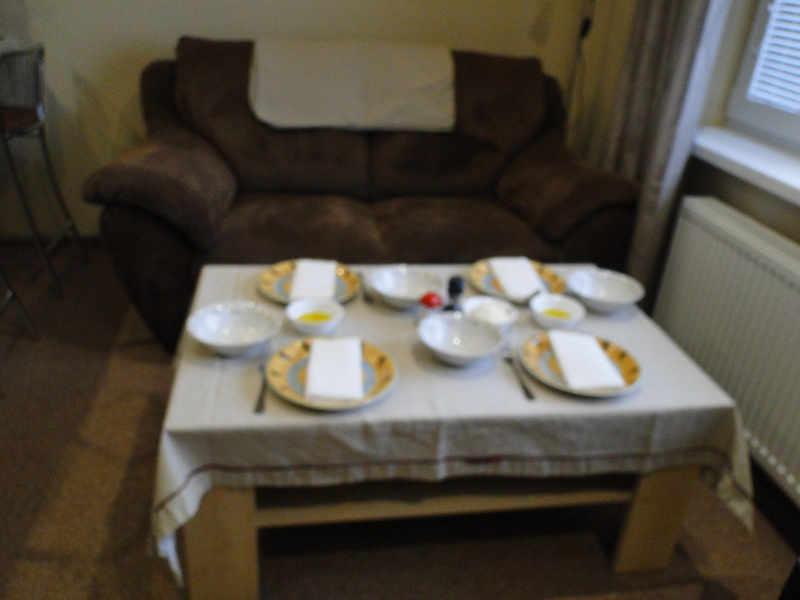 Now we go to have dinner with John, Rachel and children–our weekly family night. After nearly fourteen years, students again. Lots of students – somewhere around a hundred, although all the dust is yet to settle. So far, so good. Last Monday, after the end of the day of my last post, I thought my legs would fall off. When you’re not used to standing in front of a classroom hour after hour, about five in this case, and no longer a spring chicken, or a very long ago spring, in my case, it shows. I had to take a couple of pain pills to sleep that night. However, Wednesday and Friday went much better physically, so I’m quickly back up to speed. I had heard a number of differing reactions to the students here, and was a touch apprehensive about what I’d be facing. However, based on one whole week, the students seem just fine. As warned, it is often very difficult to get them to respond. Culturally, Central Europeans avoid familiarity. On the street, an approaching pedestrian will take such pains not to make eye contact with me that they run the risk of walking into a pole their eyes are so averted. My classes got a kick out of that observation, which I illustrated in class with the appropriate exxageration. Lots of laughs, so things in the participation department are getting better quickly. Conspiracy theories come naturally to these students, every one of whom comes from the former Soviet Union, or its satellites. Governments lie, conceal, steal, harass and generally make life miserable. Several students indicated that they had a grandparent who just disappeared into the camps, never to be seen again.That’s their heritage, and why should they think any government anywhere would be any different? After all, such democracy as has emerged in the twenty years since the Soviet collapse involves, as they see it, merely electing a different set of crooks. I’ve met several more faculty members this week, and they are an interesting and diverse lot. The big problem here is that very few are long termers, and one, two or three semesters, and they’re gone. You cannot build much of a program on that basis, or have meaningful relations with your students over the four years of their attendance. It’s wonderful to have people willing to give up chunks of their lives for no pay (and work very hard in the bargain), but ultimately, in my humble opinion, it’s no way to run a railroad. For those of you keeping score on such matters, I have classes MWF, starting at 9:45, 11:00, 13:30 (they run on military time) and 14:45. One hour long, with fifteen minute breaks. Breaks aren’t breaks for me, since there is always a host of student needs requiring attention. We’re seven hours ahead of SC, so while you all are snuggled comfy in your beds, I’m imparting wisdom. In non-academic matters, Bonnie and I woke up to our first real snow since we’ve been here. 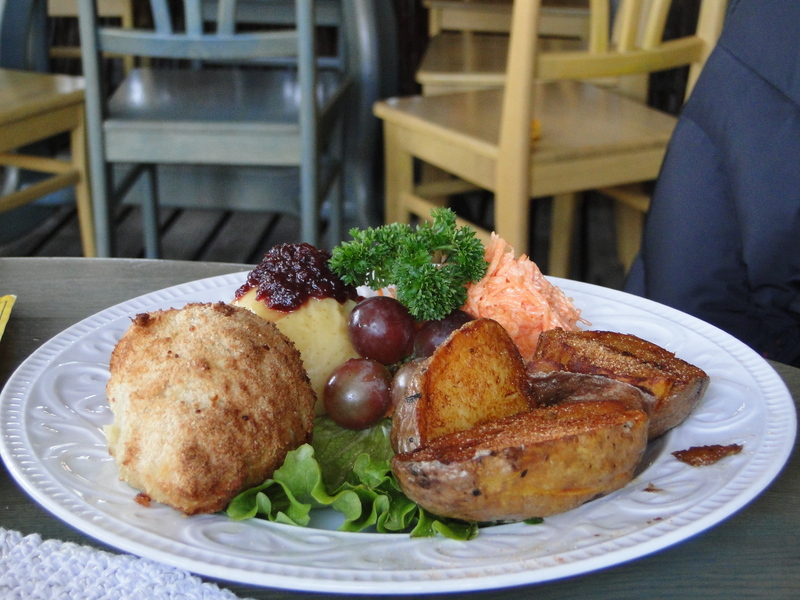 It’s now a little after nine, and at ten our Culture Coach will be here, and we’re headed downtown Klaipeda to learn some of the subtleties of shopping and dining We’ve included pictures. Bonnie mentioned our day at the beach a few days ago, and our failure to find amber. 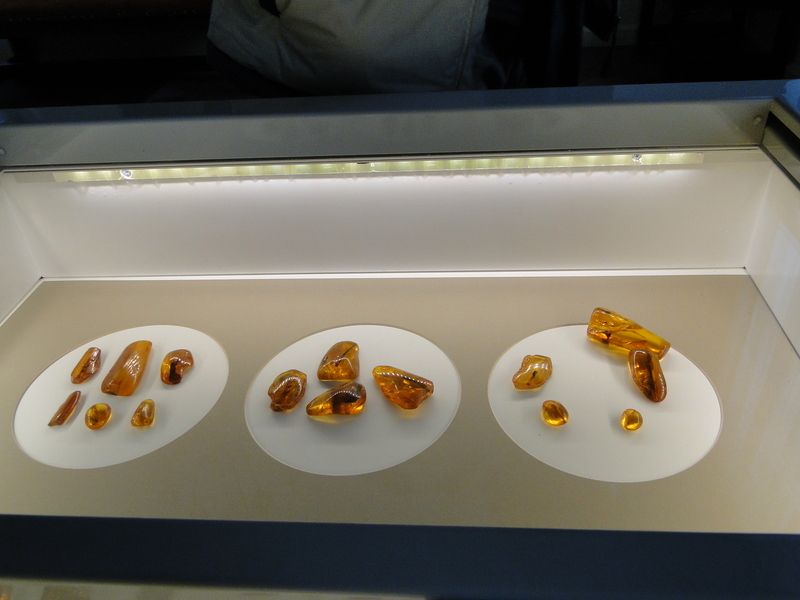 It seems there is more to finding amber than literally meets the eye. I intend to go out with an experienced amber hunter before long, although snow on the beach won’t help. Stuff continues to happen. This is a very far cry from quiet leisurely days back on the rivah. New Years Eve, for instance, sounded like we were in the middle of a battlefield. On every side rockets were flying up, firecrackers were booming (not the insipid things that pass for fireworks now, but the stuff you used to be able to shoot off back in the fifties), and the whole affair went on for maybe 30 minutes. The past three mornings I have been fulfilling some of my obligation to be somewhat useful to the staff here at LCC by handing out textbooks to students. As I mentioned before, the university buys all the books and then the students sign them out for the semester and return them at the end. I had a bit of trouble always hearing the right titles with all the various accents, but in the end all the students got their correct books and now I’m free until next Friday when I will be preparing coffee and goodies for a get together for local teachers. I will be babysitting with Noah a couple of mornings a week also. 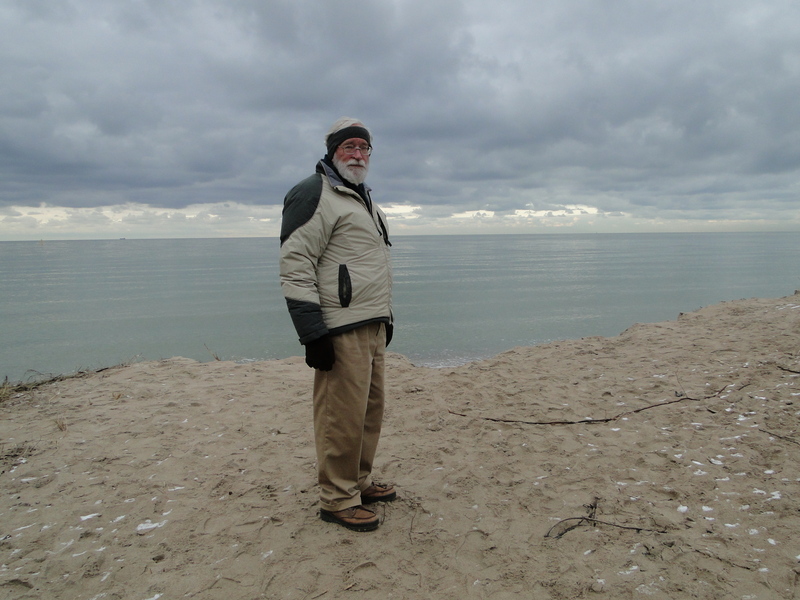 Chuck is also free on Tuesday and Thursday afternoons so yesterday, given that it was a beautiful day (which means it was not raining and was not terribly cold or windy), we decided we’d check out the Baltic Sea. After all, we have been here 3 weeks, live less than 2 miles from the sea, and have never seen it. We took a bus toward the beach as far as we could go and then walked a bit and there it was, looking much like other seas. We were surprised to see so many people out enjoying a stroll along the water too–I guess days without rain here have to be taken advantage of (it is pouring down again today.) We were hoping to find some amber among the stones and sea shells left by the tide but no such luck. I did bring home an impressive collection of beach glass and am trying to think of something creative to do with it. Any suggestions? I spent an hour or so yesterday browsing in the library and found many books I want to read–it is nice to have all this available so nearby and available time as well. I’m starting out with Nicolai Gogol and Henry James–trying to fill in some blanks in my “have read” list. In the meantime we have just finished a book we’d both like to recommend. 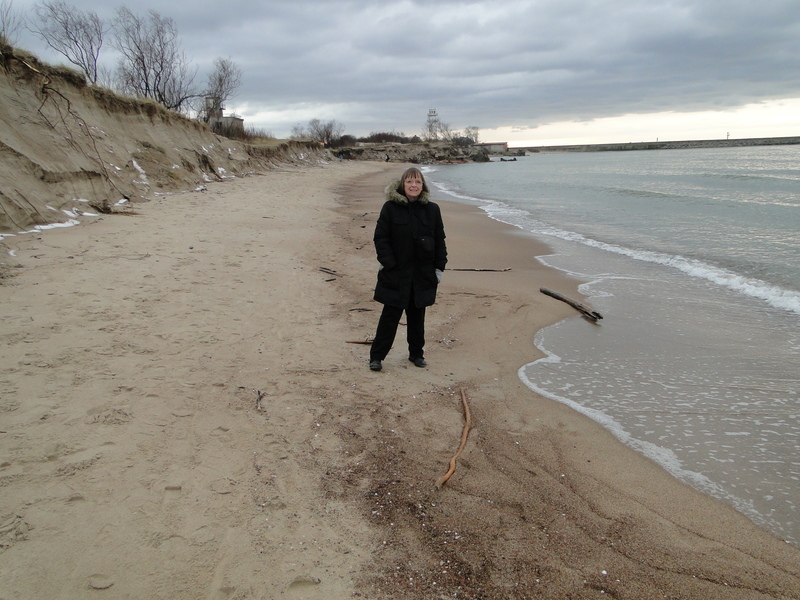 It is the story, in novel form, of a family of Lithuanians deported to Siberia by the Soviets during the Second World War, written by a descendant of that family who was born in the USA. It is actually written for young readers but we found it quite a good read. Between Shades of Gray by Ruta Sepetys. Let us know if you read it. Given there are no Episcopal or Anglican churches here, I think church will be one of the things we miss the most. We actually attended 3 church services last weekend–an interesting assortment of styles. 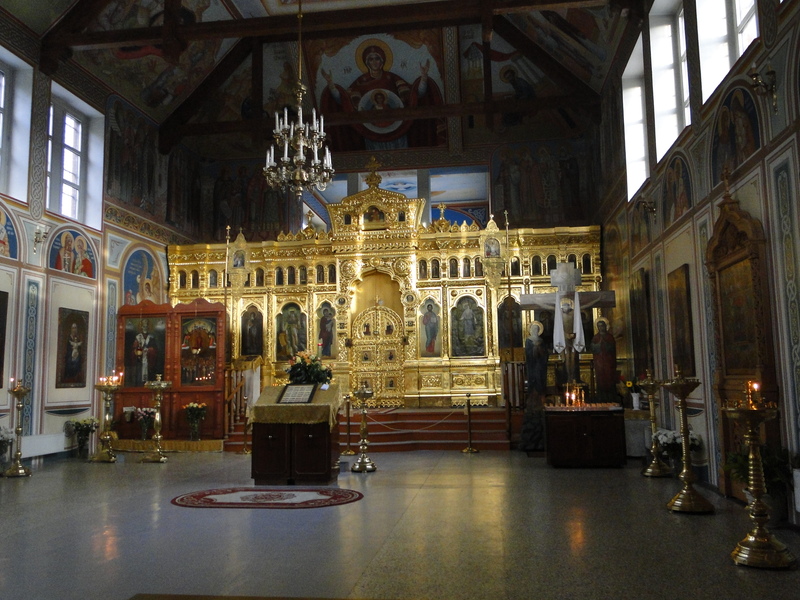 On Saturday morning we were invited to go with a young woman who works at the university to an Orthodox Christmas service in a large Russian Orthodox church. I did not think it appropriate to take a camera but will need to go back and get some photos of this picturesque church. The service was total mayhem with people milling about and bumping into us (no pews, SRO)–therefore, it was not so inspirational as it could have been. The young woman, Julianna, explained that it was because, like us, they have a lot of people there for Christmas service who are not regular attendees and didn’t know what they were doing. On Sunday evening, we went downtown to the Salvation Army and attended a service which is made up of Americans teaching at LCC. This was a standard, Evangelical-type service–several songs and then a sermon. Then an hour later, we participated in a home service of a cult. Chuck had met a young woman at the lecture series which is now going on at LCC and invited her to our apartment to discuss faith issues. She is a missionary from Portland, Oregon, living with another young woman from Washington and BC (simultaneously) who have been sent here by a church which has no name, no building, nothing written but a hymnal of songs by members and no plan as to what they intend to do here. They merely wait for people to approach them and then they invite them to their home church if they seem interested. We were number 2 and 3 as the first woman they had invited could no longer come. The service consisted of 2 songs and then each person talked about what a certain, pre-selected, scripture caused them to think . No comments on what anyone said were allowed. As there were just the 4 of us, that didn’t take long even with Chuck being one of the 4. 🙂 If you wish to know more about this cult, Google “Sects–The Truth”. We’d never heard of it before. 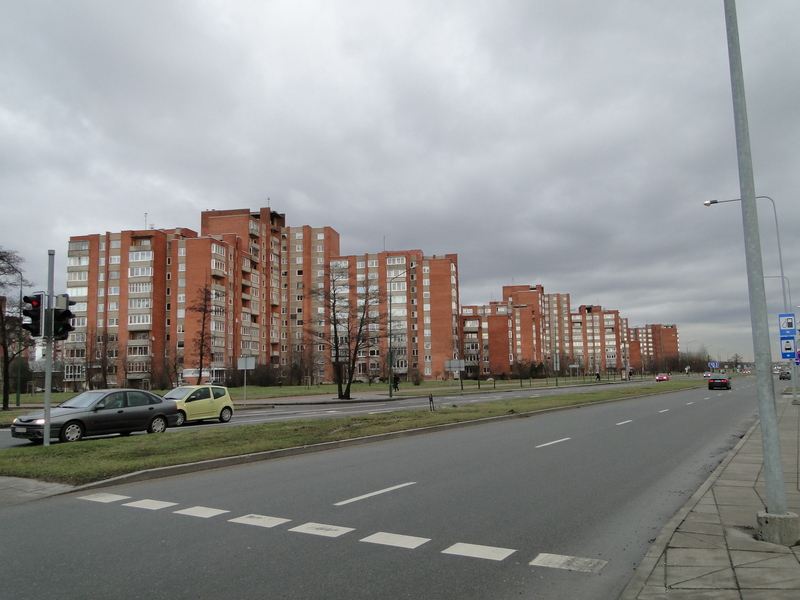 I am also including pictures of the Soviet area apartments that are everywhere here–miles and miles of them– all exactly the same. Such dreary architecture. At least in the Old Town section of the city, there are some lovely buildings. These pictures were taken near LCC. It is time to get dinner prepared so we can go off to another lecture in the January series from Calvin College (Grand Rapids, Michigan – LCC is Europe’s only remote site)–about how the New Generation of Christians is restoring the Faith–should be interesting . Chuck intends to post again after he’s had a week or so under his belt. He’s got his hands full! Here it is: my first day of classes in over 13 years. As I sit here, about an hour before the start of my first class, it seems like old times. Students are everywhere, and there is a buzz in the air. I suppose it’s like riding a bicycle – you never forget, but last year when I got back on a bicycle after a lot of years, I was a trifle shaky. Since I start off with four classes back to back, I guess I’ll have to get over any butterflies pretty fast. Last week, just as in the old days at Siena Heights, there were faculty meetings before the semester got launched. Unlike the Heights, these were mercifully brief. Being a new kid, as is Bonnie, we had to undergo lectures on Health and Safety. Then we had to sign journals assuring the various ministries here in Lithuania that we had been dutifully trained. (And sign a bunch of other papers as well.) I now know that I must keep my eyeballs at least 40 centimeters away from my screen on my computer, and I must not look at it for more than an hour straight. I shouldn’t talk for more than an hour straight either before resting my voice. How long I have to wait after the hour to look again or talk again wasn’t specified, or maybe I missed that part. Before long Bonnie and I will have to have a physical check up to make sure we’re healthy enough to work. So far I feel up to the task, but one never knows. 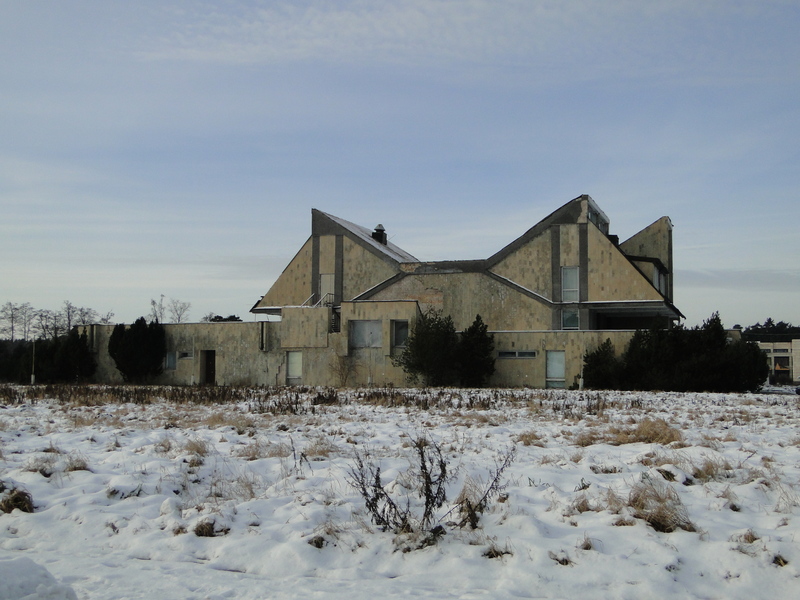 Many changes have taken place since that last first day in January of 1998. Technology, for instance. Back in the day, a blackboard and a piece of chalk wasn’t exactly state of the art (white boards and colored markers were more au courant), but those had the virtue of simplicity. Now it’s smart boards. I think it’s called a smart board because, by comparison, I feel essentially dumb. Anyway, after some help from student assistants, and much practice over the weekend, I’m now checked out enough to turn the thing on. From this point, it’s all uphill. I will admit the technology is mighty slick. It would be nice to have this back at the Redeemer in the Sunday School space. John just popped his head in the door to see how his Old Man was feeling. Sleeping O.K.? Funny how the years alter relationships so radically. My mind returns to one rainy day in the mid eighties when I watched Matt and John get on the school bus in their bright yellow rain slickers. The image has remained indelibly impressed, for some reason. The years do roll. It’s about time to saddle up for class. My syllabi are all done, and forwarded to the registrar in proper form. In Lithuania, I am informed that these are legal documents, so formats and outlines must be strictly followed. I’m not sure whether involving lawyers and doctors in the teaching process is a step forward or not. We’ll see. Little things mean a lot. I had to make my own index cards – they do not exist in Lithuania. I forgot (really, I couldn’t have taken it anyway) my old Procter & Gamble briefcase, so now I’m reduced to shlepping stuff to class in an old canvas bag John gave me..
I’ll have a bit more to say after I’ve gotten a week under my belt. Until then, I covet your prayers. That’s one more thing very different from the past – here you are expected, gently, subtly, to witness to your faith. The Bible has a great deal to say about economics. It will be refreshing to be able to say so.